Two overhauled exhausters at Bowers Two overhauled exhausters at Bowers. One of these exhausters was purchased from Booths from a scrap 37, the other from Unipart Rail. Both are now finished, the ex-Booths machine had an oil leak which has been repaired, and the Unipart one has been tested and some work undertaken to bring it up to "overhauled standard" after its lengthy period in store. Two overhauled exhausters at Bowers. One of these exhausters was purchased from Booths from a scrap 37, the other from Unipart Rail. Both are now finished, the ex-Booths machine had an oil leak which has been repaired, and the Unipart one has been tested and some work undertaken to bring it up to "overhauled standard" after its lengthy period in store. Motor blower in process of overhaul at Bowers One of these motor blowers was finished some time ago. The second motor blower is nearly finished, but Bowers are waiting on a new bearing for it. April 2013. 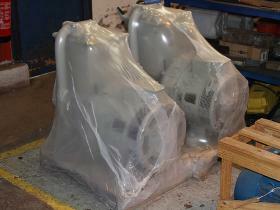 One of these motor blowers was finished some time ago. The second motor blower is nearly finished, but Bowers are waiting on a new bearing for it. April 2013. Traction motor blower snail and fan at Bowers The fan motor air duct and casing from one of the traction motor blowers we are having overhauled at Bowers Electrical. 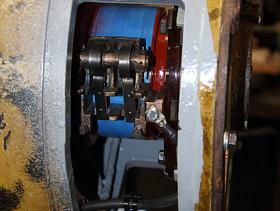 The fan casing itself has been resprayed to match the condition of the rest of the machine. April 2013. 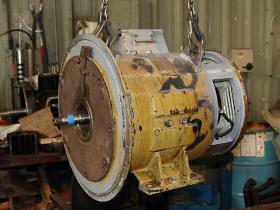 The fan motor air duct and casing from one of the traction motor blowers we are having overhauled at Bowers Electrical. 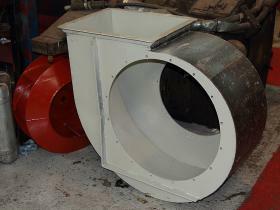 The fan casing itself has been resprayed to match the condition of the rest of the machine. April 2013. Traction motor blower overhauled brush gear seen in closeup Closeup view of the overhauled brush gear in one of our traction motor blowers at Bowers Electrical. April 2013. 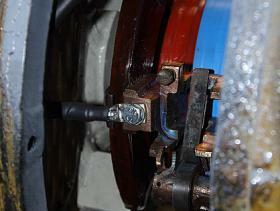 Closeup view of the overhauled brush gear in one of our traction motor blowers at Bowers Electrical. April 2013. A further close up of traction motor blower brush gear A further closeup of the overhauled brush gear in one of the traction motor blowers being overhauled for RRRG by Bowers Electrical. A further closeup of the overhauled brush gear in one of the traction motor blowers being overhauled for RRRG by Bowers Electrical.